Peter Britt, a Swiss emigre to the Jacksonville, OR area in the 1850’s, was an avid horticulturist, especially in his later years. He was also a photographer, a miner, financier, orchardist, having planted both peach and pear orchards, and a vintner. His photography business was primarily portraiture, but he travelled around Oregon taking pictures of the landscape and farm country when he could. He was the first to successfully capture Crater Lake in photograph. 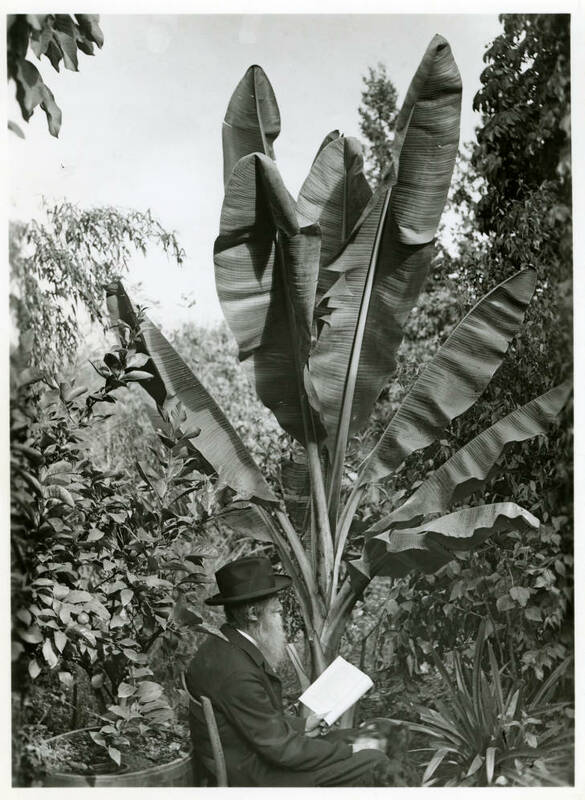 This is a picture of him reading under one of his banana plants, probably taken by his son, who had joined him in his photography business. The banana is identified as ‘Musa ensete’ a name no longer accepted. This is now known as Ensete ventricosum and was most likely grown from seed. He successfully cultivated palms and banana plants, jasmine and magnolias, oranges, and gingko trees in Jacksonville, a zn 8a area. The largest, oldest, Sequoiadendron gigantea in Oregon still stands on his old estate planted at the birth of his son. It is 205′ tall. I am ‘new’ to the Portland area having arrived here in 1985, which, by the way, turned into one of Portland’s colder winters. It was a time when I was first really getting into ornamental plants. Earlier my interest was around edibles and natives. Having come from the colder and more conservative landscapes of central Oregon, everything here was new and exotic. I remember bringing a Camellia japonica flower into ‘Plant Materials’ class amazed by it, while many of my fellow students, locals, snickered. I got a part time job in the Elk Rock Garden at the Bishop’s Close and was daily in a state of amazement. While riding the bus from Oregon City to Elk Rock we would pass a restaurant on Hwy 43 that a friend had pointed out to me previously, in Lake Oswego, with a Chinese Windmill Palm out in front. I was stunned and intrigued. 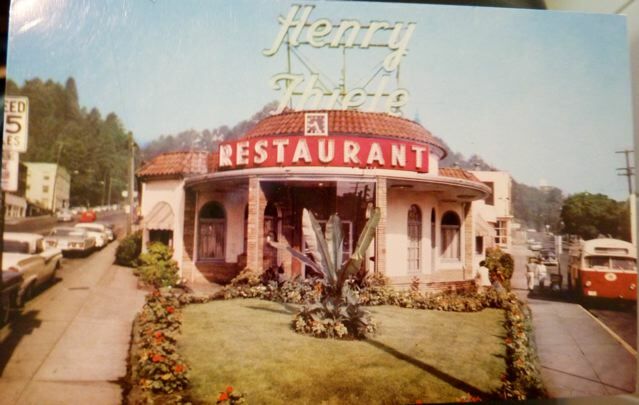 Later after having started working for Portland Parks, probably ’87 or ’88, I saw the banana growing out in front of Henry Thiele Restaurant on Burnside and NW 23rd, or is this just a memory of an old picture? I found this picture, probably from the early to mid 1960’s, (Isn’t that a ’60 Ford Thunderbird along the curb left?) on the Stumptown Blogger’s site. It shows what appears to be an Ensete v. ‘Maureli’. On these the entire leaf is ‘backed’ with a deep ‘red’ color. I began growing bananas here in Portland several years before Burl Mostul moved his nursery, Rare Plant Research, down south of Oregon City, when it was still at his house out on SE Harold. Burl has always been a big promoter of exotic plants and in his earlier nursery years, Musa basjoo, along with his masses of Lewisia, and his burgeoning array of tender collector plants, was his ‘baby’. His driveway was lined with it. I planted it downtown and in my home garden. I would go out and visit with him about plants and he would always be talking about his favorites and the plants he was testing and ‘scheming’ to bring in and market, and I mean that in a good way. Several years later a horticultural co-worker started growing M. sikkimensis in his home garden and I went to see it, liked it better, sourced one and planted it first downtown before subbing it out at home sometime in ’02 or ’03. My scattered records show that I bought it in ’01. Having grown both Musa sikkimensis and M. basjoo over the years, I prefer M. sikkimensis. 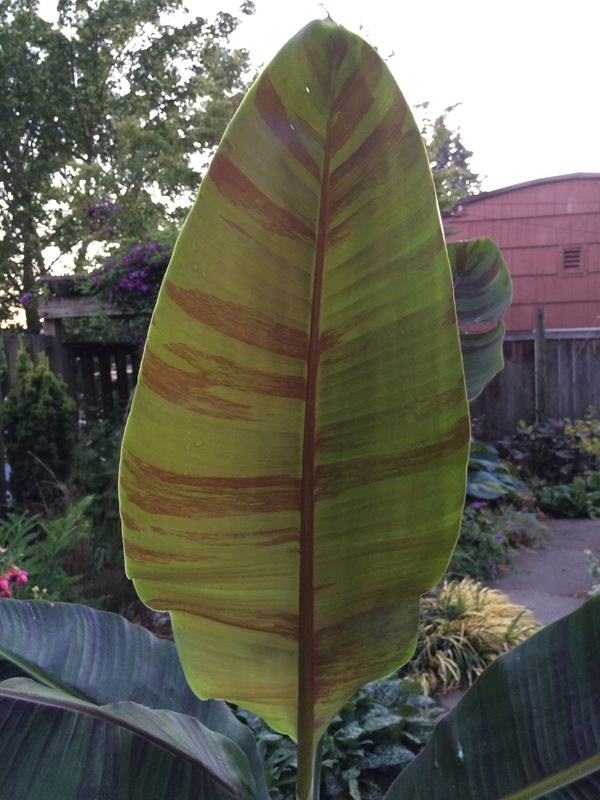 There are subtle differences in how they hold their leaves and M. basjoo, the more common and longer grown hardy banana in the PNW, tends to get shredded and tattered more easily….M. sikkimensis has slightly thicker leaves and also tends to be a little darker green in color with some red in the mid-ribs of its large paddle shaped leaves…which can be especially showy back-lit by the afternoon sun. This species’ tendency to produce red in its leaves has pressed collectors and growers into finding cultivars that more consistently display this attribute…which brings us to M.s. ‘Red Tiger‘. Not surprisingly, Musa sikkimensis, comes from the Indian province of Sikkim and can be found growing on into the tiny country of Bhutan as well as in Assam and Manipur in the eastern Himalayas, a region with a climate that ranges between sub-tropical at it’s southern, lower, elevations and alpine/tundra in its higher north. Warm/wet summers, monsoonal, with relatively mild somewhat drier winters. This species is found in the lower/milder parts of the area around 6,000′ where it can occasionally receive snow. Sometimes this is called the Darjeeling Banana after the town which once served as a ‘resort’ for the occupying British Raj. Darjeeling, at 6,700′, is a comfortable escape from the heat that consumes so much of India. Before it came under threat due to deforestation, Trachycarpus latisectus, a zone 9 plant said to be able to come back from temperatures in the mid-teens, if you want to experiment, was found in the same region growing under very similar conditions, the banana though has proven much more cold hardy than the Palm here. There is no ‘rule’ that says all plants from a particular region will perform equally, just as there can be a variable range for hardiness within a given species. My ten year old T. latisectus died for me planted out over the harsh winter of ’16 -’17, which was the coldest winter since ’93…that winter was just a hiccup for the banana. Like M. basjoo, M. sikkimensis, requires time to flower…if that is important to you. M. basjoo’s flowers are more of a novelty than a beauty, but still its fun to see. In order to do this a shoot must successfully winter over to flower. It is not a ‘chilling’ requirement, like apples have, it simply requires more than a single summer season here to reach maturity. Though this species is not tropical, overall the genus is and this basic growth pattern developed in response to their common origin… they didn’t have a growing season ‘framed’ by cold periods. Burl once told me how many leaves a given shoot produces before it is mature enough to flower, but I’ve forgotten now. Suffice it to say that in the PNW it takes over a year. This requires either a very mild winter and/or that we protect it from freezing down. One source, writes that M. sikkimensis, takes even longer, at least 3 years before flowering, I need to check this as it seems like an extraordinarily long period. It hasn’t ever bloomed for me. Keep in mind that each shoot is monocarpic and having flowered once, is done. The spreading mat is the Musa’s rhizome which increases its meristem across the top and, with it, its ability to produce new shoots, flowers and fruit, but how tough are these, what can one of these ‘shoots’ take? Observers have written that growth in M. sikkimensis stops at around 41ºF or +5ºC, that the leaf cells begin to freeze at -2ºC or 28ºF, the stems beginning to freeze somewhat below that especially during periods of extended freezing temps. M. sikkimensis is root/rhizome hardy down to zn 7 or 8a depending on the supplier. M. basjoo is said to be root or rhizome hardy into usda zn 5 with mulch. If you garden in an area that gets down to the single digits or colder, you might need to stick with M. basjoo, but it would be worth it to try M. sikkimensis in such cold areas. Obviously the shoots freezes down well before it reaches the rhizome’s lower limit. These have no problem rebounding in the Spring, like M. basjoo, but they tend to be a little slower as they seem to require more heat, though they do very well in Portland. If you want flowering then you’ll have to protect them in an average or colder winter, here. Colder regions will require it every winter. If you choose to wrap them use something that ‘breathes’ like straw, grass matting or ‘garden fleece’, sometimes marketed here as Reemay, or a cage of loose dry leaves, some people use fiberglass insulation, with perhaps a ‘tent’ to keep the insulation dry…bubble wrap, as it is unbreathable, may lead to rotting. While not generally necessary here in our zn 8 climate, in colder areas it’s probably a good idea to provide some insulation/protection to the rhizome, below the soil surface, in the form of straw or coarse leaves. Bananas over all seem to have inherited another characteristic common to many tropical plants and, in contrast to many temperate plants, they should be divided when they are actively growing, even these few cold hardy species. Remember cold dormancy is not a ‘thing’ with tropicals, they have not evolved needed defenses to ‘injury’ during such cold periods…they simply can’t grow anymore, which in their case means, they can’t respond effectively to injury. For them injury simply opens them to infection and rot during cold periods…and our soils here are full of many fungal rots that these are ill prepared for. Divide them when they are actively growing. Musa acuminata ssp. 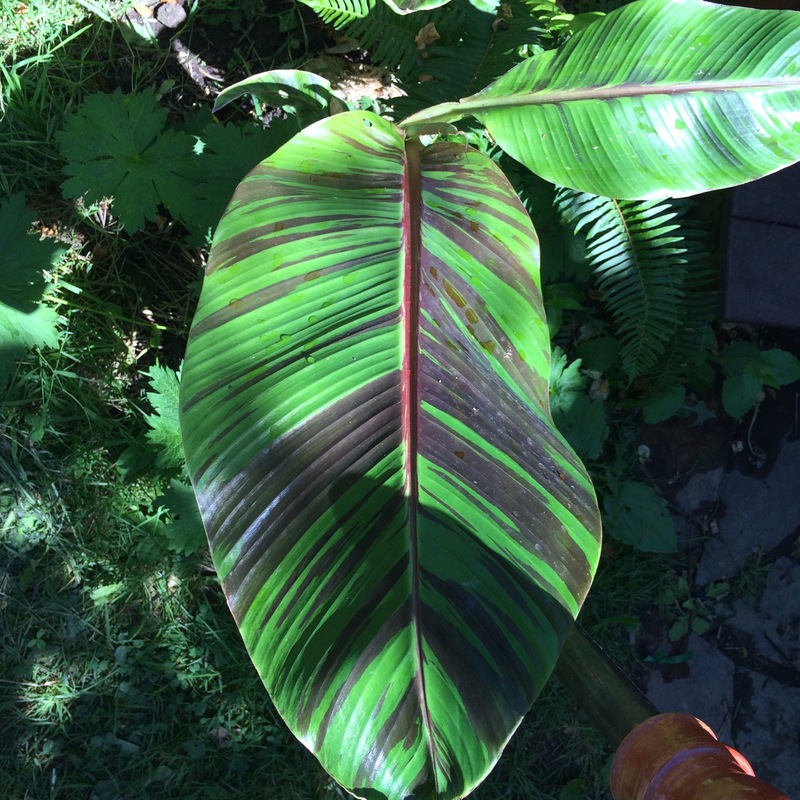 zebrina growing in its large pot in my garden, a tender banana from Sumatra and Java..
Musa acuminata ssp. zebrina back lit by the afternoon sun setting off its variegation. The other red variegated bananas produce the same effect with low angled sun. When I bought my M.s. ‘Red Tiger‘ it was well marked, not quite as spectacularly as Musa acuminata ssp. 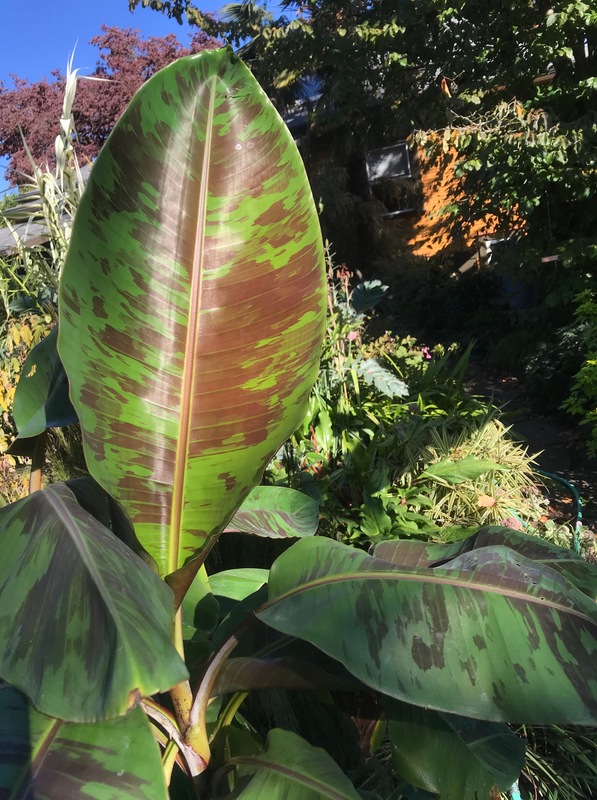 zebrina, the tropical and tender banana from Sumatra and Java, which I’ve grown for nearly 20 years, dividing and protecting it each winter. M.a. ‘Siam Ruby’ is even showier. I was excited about M.s. ‘Red Tiger’ because it had the ‘whole package’, hardiness, stature and variegation. Somewhere along the way mine lost its red markings…almost completely! This seems to be a common occurrence. At Rare Plant Research Burl Mostul grows all of his plants for sale from seed, it takes about 1 year to grow a salable 1gal plant, and he says they seem to vary from plant to plant in their coloration. Sean Hogan, at Cistus, thinks that the variegation is some how tied to the plant’s growth rate and that slower growing plants tend to keep their variegation. My own plant, having been relegated to life in a pot had been up-potted several times and was in a 15gal when it spent the entire winter in a friend’s cool greenhouse for the winter. It’s stripes had already been fading, but after this they were gone. Previously, it would spend all but the coldest periods outside when I would haul it into my cool basement during sustained freezing periods…(I hadn’t decided where to plant it in the garden and what would need to come out to make room for it). There doesn’t seem to be a definitive explanation of what is happening…It’s a nice plant regardless. Now I’ve heard that a new red clone has become available, M.s. ‘Bengal Tiger‘…. I haven’t tried it yet. I’m a little reluctant as several on-line sources suggest that the names have been confused and/or that it loses its red coloration as well. Does anyone really know? Worldwide there are 68 different species of banana, genus Musa. The family Musaceae includes them and genus Ensete which contains eight species, though most botanists reduce that to seven and pull Ensete lasiocarpum out placing it in its own genus as Musella lasiocarpa. The center of genetic diversity for the family is in SE Asia. Current thought and research has all three genera originating in India, Musa spreading southeasterly from there as new land was added, in the form of the Malayan Archipelago and the larger islands, while Musella moved easterly, the closely related Ensete moving much later to Africa, to the west. This map shows in light blue the areas where uplift is occurring due to one plate pushing into another. At the time of the origination of bananas, thought to be some 50 million years ago (Mya), India was tropical and bound by the Indian Ocean on all sides as it travelled north into Asia having broken away from Antarctica which was once bound up into the larger ‘super-continent’, Gondwana….It’s a pretty bizarre concept for most of us to imagine continents as ‘floating’ and colliding with one another over unimaginable time scales, but they do and still are. 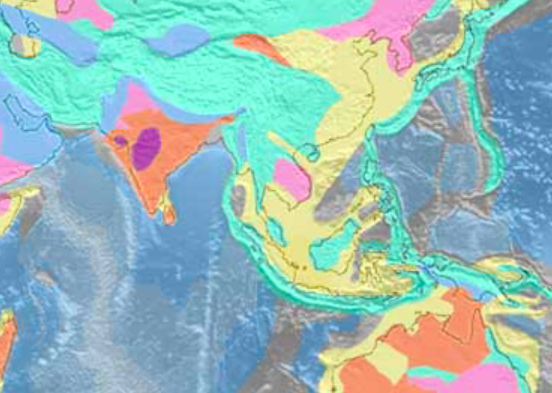 On this map there are several things worth noting: first, the area marked Persia-Tibet-Burma Orogeny, is an area of major uplift resulting from the continuing movement of the India Plate north; second, the Ninety East-Sumatra Orogeny defines another area of uplift where the Australia Plate has ‘crashed’ into India, Burma and the Sunda Plates. 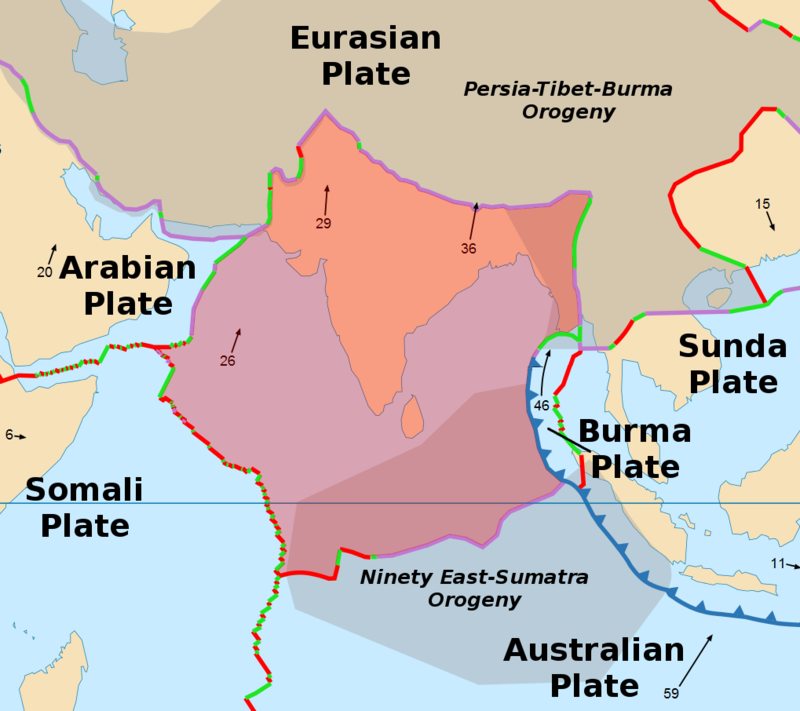 The Australian Plate or Suhel is now beginning to ‘break away’ from India as it begins to rotate counter clockwise, its momentum carrying it faster along its eastern edge into the less massive Sunda Plate; Third, a side note, to the west, the Somalia Plate is beginning to separate from the rest of Africa creating a ‘break’ or rift called the ‘East African Rift System’. A large area within the East African Rift System, south of the country of Somalia contains the home of Ensete ventricosum. India collided with the continent of Asia beginning a long period of change throughout the region extending into China and southeast. Malaysia, as we know it today, did not exist before the two continents first came into contact. Bananas began the long process of speciation and radiation, the creation of new species and their spread at this time. India was part of the Indo-Australian Plate at the time which was itself previously two separate plates when Gondwana initially broke up. Sometime after India broke away from Antarctica, Australia began on its own northerly course, separate. Later on in their movement the two plates of India and Australia were wedded together as they made their northern journey. The plates’ surfaces continue beneath the ocean linking the two dry land masses. The two began much later the slow process of separating…around 3 million years ago. Geologist speculate that this is a result of the ‘collision’ with Asia. Australia is doing a very slow ‘spin’, its east coast rotating northerly at 2.2″ per year, more quickly than its west coast which is moving at 1.5″ per year. 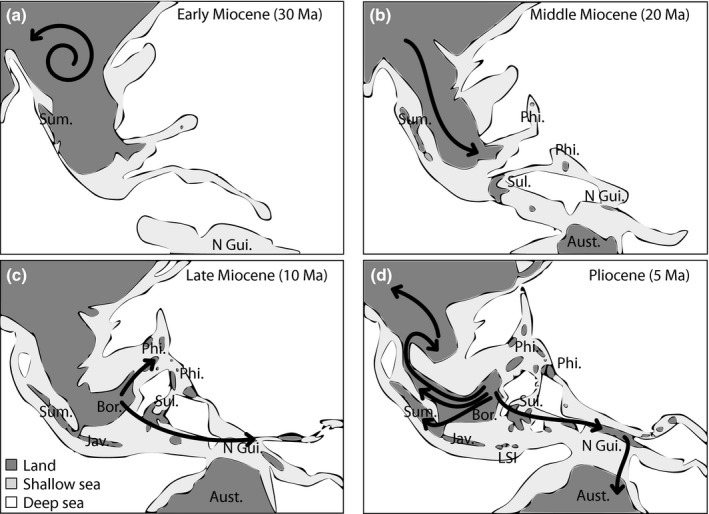 It is important to note that at some point the gap between Australia and Antarctica widened and deepened enough to allow a circumpolar ocean current to begin, the net effect of which was the cooling of the Earth’s climates at the end of the Eocene, around 34Mya, as all of Earth’s current’s circulation changed with it. This ushered in a so called ‘Ice House’ climate. During the Eocene India accreted, or attached its land mass to Asia, after having been traveling much of the distance across the Indian Ocean at the excessive speed of about 8″/year. At this point the continent’s flora and fauna, began their outward spread moving on to adjacent tropical lands of the Asian continent, and presumably, in the reverse direction from Asia into India. A massive uplifting began as the two plates came together manifesting in the Himalayas, the Tibetan Plateau, the Hindu Kush and the central mountains of China, immovable object into immovable object. This uplift, upon reaching a certain elevation, would become an effective block to the colder continental air masses that followed the Eocene, protecting the bulk of India, the colder temperatures effectively trapped to the north of the mountain ranges. This, along with India’s monsoonal weather pattern, and its ability to ring moisture out of the the warm moist air that blanketed the subcontinent as it rises and cools against the mountains the rest of the year, enables it to continue its more tropical climate providing long term stability for its flora. The central uplift in China did much the same for the southern Yunnan region though somewhat less effectively. Thus protected, this region, around and north of the latitudinal limits to the tropics, has been remarkably mild/tropical and stable in terms of its climate, over millions of years. For many millions of years, until 30Mya, this is where Musa diversification happened. After this point the Malayan Archipelago and Philippines began to form in response to the northerly moving Australian Plate. The arrows show the extent of movement of Musa species by the dates shown on each map. At 30Mya the spiraling arrow indicates a time of speciation and radiation within the continental portion of SE Asia. Later they indicate its movement ‘back’ as the islands break away from the Sunda and reform in response to the advancement of the Suhel and the continent of Australia. (d) the latest period shown, 5Mya, shows the extent of this movement before the ‘glaciation’ periods of the Quaternary, 2.58 Mya, the most recent Ice Age, when the Earth began cycling in and out of these periods of the expansion of the polar ice caps toward the equatorial region and their following retreat. The maps above show the advancement and direction of movement of genus Musa as the land itself developed over time. The major islands developed from Asia and the Sunda Peninsula itself separating easterly while Australia moved northerly. Over time genus Musa dispersed east and down the Sunda Peninsula, their seed carried by animals that consumed their fruit. Species form over very long periods of time, often as a result of isolation and in response to changed conditions. Eventually, separated onto islands, the different species were ‘free’ to take their own course without any continuing genetic influence by species isolated on other islands or on the Sunda Peninsula and India. Their rate of change is thought to be increased by the fact that their flowers and inflorescences make them less likely to self-pollinate allowing for a more continuous mixing of genes, unlike Ensete spp. which are prone to self-pollinate…. Musa spp. would have occurred widely across available land well before the onset of the glacial period of our most recent Ice Ages. Musa sikkimensis, M. basjoo and M. velutina, resulted over time surviving in relatively high elevations or northerly latitudes. There are limits to what any organism can survive and these, and their predecessors, marked this extreme for the genus. Ensete, which are very likely to self-pollinate, a process which reduces the amount of genetic exchange, was more limited and slow in its process of speciation. Their larger seed, would tend to drop and germinate nearby, slowing their physical dispersal and make them more likely to form dense and compact communities, as they do today in Africa. The larger seed is thought to have been a more attractive food source for birds which would have been able to move it over landscapes that were too dry or otherwise unsupportive. Ensete are not mat formers, their rhizome does not spread into a suckering mass. Each plant forms a monocarpic shoot atop its individual and smaller corm. Evidence suggests that Ensete stayed largely in India until much later limited by the dry climate to the west until a wetter period allowed it to move, likely with the aid of birds which are more capable of traveling distances across less hospitable landscapes. At some point, when the Eocene still supported it, Ensete made its way to North America likely following the coast. They are believed to have gotten to Africa later. There is no evidence for the speciation of Musella. It is largely thought to have evolved independently, isolated as it was, in response to its colder, higher and more northerly location. As a more northerly plant, over time it had the capacity to adapt to its significantly colder and drier conditions in the mountains of Yunnan where it is today found as high as 7,500′. It is believed to have been very common across its range at one time which people began to occupy thousands of years ago as the land was exploitable and conducive to agriculture. In some areas Musella l. shoots are still chopped and fed to pigs on farms. The Sahul, and land mass of Australia, is still moving northerly, the east coast of Australia moving at the rate of 35.5 miles/million years, + or -, its plate grinding into that of the Sunda, heaving up or being subsumed, volcanoes birthing completely new land from the vents, thin spots and fractures in the crust near their shared edge. The ocean floor crust is thinner at this point of ‘impact’ so no Himalayan equivalent mountain range has formed…so far! Instead the Archipelago’s little islands have ‘propagated’ in the area of Wallacea…some 20,000 islands, in total, most of which are less than 10 sq.km.! The sea area here is relatively shallow, the ocean floor risen in response as well. These ‘young’ islands lie between Boreno, Sulawesi and New Guinea which have added land mass to themselves as well, as the impact continues to play out. The resulting Archipelago possesses a unique blend of the flora and fauna, all tropical, of the two continents. All of these islands have been sharing their genetics with each other back and forth with each glacial cycle. While cultivated bananas are grown throughout the tropics and subtropics, having been brought there by people, the range of any given species of Musa throughout these islands is more limited, a product of the dynamic geological processes and larger cycles of the climate. Our continuing ‘inter-glacial’ period today is isolating each island’s particular Musa species from others, much as it has for the last several thousand years…. Banana species can be traced through the physical record in the earth moving from India, across southern China and down through SE Asia to the Wallace Line which marks the position of the two plates, Asia and Australia. The gray areas show the shorelines during the Ice Ages when Bananas and many other plants would have been forced in front of the Ice Sheet. Most of these stopped at the Wallace line which is marked by a deep trench that stands as a barrier to the movement of larger flora and fauna. The many small islands between there and Australia and New Guinea are a mix of the more ‘mobile’ species. Bananas are native to those lands above this line including the Philipinnes. 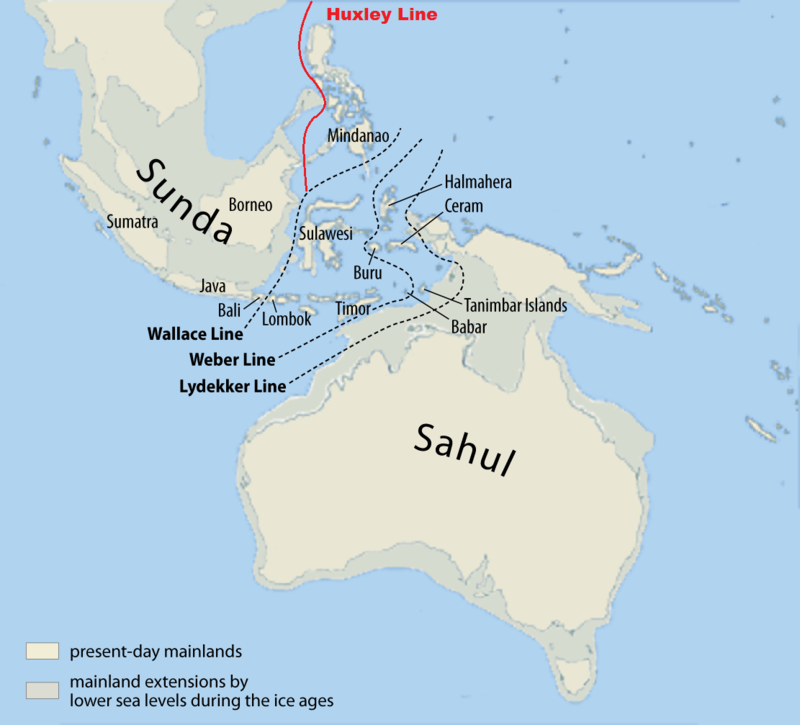 The Australian plate, the Sahul, continued moving north, with islands forming or increasing volcanically, the ocean floor rising, ‘growing’ the links that would help with the flow of Musa genes when ocean levels dropped during the ‘cold’, glacial periods, of the Ice Age. ‘Glacials’ are when the ice is expanding from its polar ‘minimum’ and holding at its equatorial extreme. ‘Inter-glacials’ are when the ice is retreating from its equatorial maximum to its polar minimum and holding. The last glacial advancement, ended 10,000 years ago. The cycle has a pattern, beginning its advancement at about 40,000 years, then beginning its retreat, rewarming, at around 100,000 years. We are currently in an inter-glacial or warm period. The ‘glacial’ periods of an Ice Age result in radical drops in the level of the oceans, over 120m historically, which greatly expands the area of dry land around the world and throughout the Malaysian Archipelago, the Sunda and Suhal, often joining islands into larger land masses more supportive of the movement of both flora and fauna over the thousands of years of these cycles. This ‘new land’ provides more landscape for the bananas and other tropicals to move to, as they lose land, closer to the poles, to the expanding polar cold, assuring the survival of tropicals, supporting the mixing of previously isolated genetic populations, providing them with another opportunity to adapt and diversify. Plants and animals of temperate regions are pushed toward the equator as well by the conditions, surviving where ever they can find a refuge. These are much smaller than their former range. Some species are lost. With the rewarming of the north the tropics return, the seas reclaiming the lands from which it had once retreated. The warning brings, the rising oceans, reforming many islands and once again isolating their plant communities….During these warm cycles many plants, along with newer species and variants, with their altered genetics, move north where they can. As always it is along these margins created by latitude, elevation and water where change occurs. Gene flow is increased during the colder glacials, formerly separated plant communities expanded and connected followed by periods of isolation in which species can differentiate. Musa species fit into two genetically connected ‘clades’, or lines of evolution, the newest, youngest, include species found in the Philippines and Australia and have a New Guinean ancestor. These species are more distant and isolated from those found on the mainland and have, consequently, varied genetically further away from them than those geographically closer. The other, older, genetic clade, can itself be divided into a younger and older division, the older species all having a strong links to the more northerly Indo-Burma region of the continent, while the younger group, forming more recently in Malaysia, are more directly linked to Sumatra and the Malay Peninsula. These ties are observable within the DNA of the living species. This cycling, the rising and falling of sea levels, the retreat and return, due to changing climatic limits, effectively ‘reshuffles’ and alters the genetics of genus Musa, repeatedly establishing and breaking the flow of genes between them. The large majority of Musa species still live under tropical conditions. Bananas were pushed north and south and up and down mountainsides by the colder air, well ‘ahead’ of the frost line and the leading edge of ice. Each of the periods in this cycle lasted many thousands of years. ‘New’ land, previously added by volcanism and uplift became available, a process that continues, very slowly today, while other land was taken away by rising oceans, then added back by the north-south movement of ice. Each glacial period pushed this process across a changed landscape. The ending of glacial periods of an Ice Age effectively added ‘pressure’ to the species, reducing available southern/coastal land while at the same time making more available to the north while raising the upper elevational limit. This cycling has spelled the extinction of some species if they lacked the needed ability to compete and ‘move’ and provided the opportunity for both adaptations and the creation of new species. Within a given basic structure there will be limits to what any living organism can tolerate. These are set by their genetics, which control both an organism’s structure and the metabolic systems within them. There will never be bananas living in the tundra just as they will never develop wood or bark. Their large, relatively ‘soft’ cell structures include more free, unbound water, which is more subject to freezing and freezing water, within the cell structure and the vascular system of a plant, when those structures are not sufficiently ‘hardened’, as they can be by lignin in wood, will rupture and lead to a given cell’s death. (Water in general, can remain in a liquid state well below freezing temperatures, be ‘super-cooled’, if the volume is small enough and it is bound in close contact with suitable surfaces, like plant proteins. Water also requires the presence of particular ‘impurities’ to initiate the forming of the first ‘crystal’ upon which ice quickly ‘builds’.) Temperate, and plants from colder regions, have evolved survival strategies that bananas have not. Colder banana ‘hold outs’ are few. The four that demonstrably have, Musa basjoo, Musa sikkimensis, Musella lasiocarpa and Musa velutina . Musellla lasiocarpa also possesses the most ‘drought’ tolerance…though it can’t come anywhere close to the tolerance needed to survive in even semi-arid climates. Musa velutina, another eastern Himalayan native, would seem to belong to this group as well. The large majority of the world’s plant species are tropical. Overall as temperatures drop the number of species that can succeed, declines. Life requires warmth and liquid water. Landscapes that remain frozen year around support no higher, vascular plants at all. 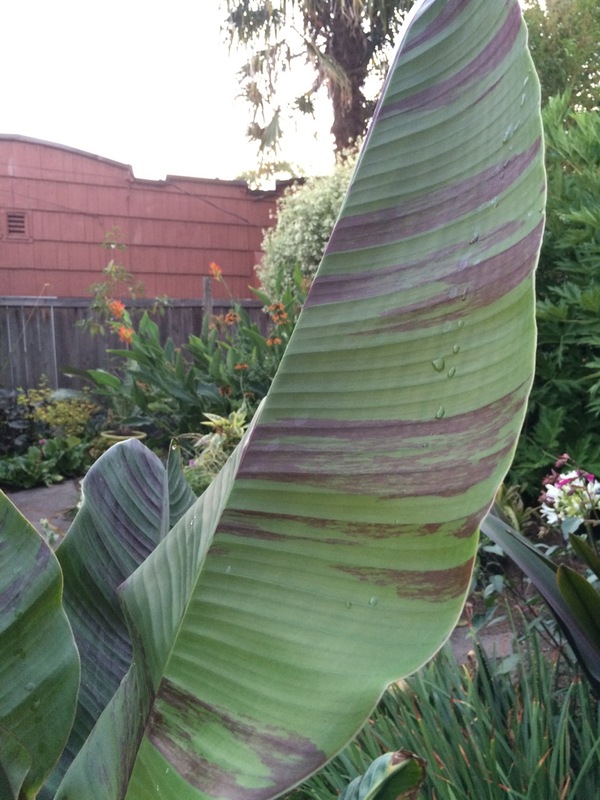 The pseudo-stems of bananas and their leaves are herbaceous, non-woody, but unlike Hosta and thousands of other herbaceous perennials from temperate regions, they are generally unable to protect their meristem tissues in the ground and so freeze damage can be extensive and rot can invade any adjacent unfrozen tissue. Tropicals have no defense to this. The bulbs of so many plants we grow may seem similar in structure, but their genetics, protect them from the freezing that is fatal when tropicals like bananas are subject to it. These four ‘hardy’ species, as a result of having adapted to colder temps, at higher elevations and or latitudes, have developed similar survival strategies to freezing. These may involve chemical metabolites they themselves produce which work effectively as a kind of anti-freeze or some other strategy they use to protect their meristem. Such strategies tend to evolve over a great many generations while subjected to a tolerable, and mostly stable range of extremes. Such conditions held in a relatively narrow northerly band along the margins of bananas’ range. 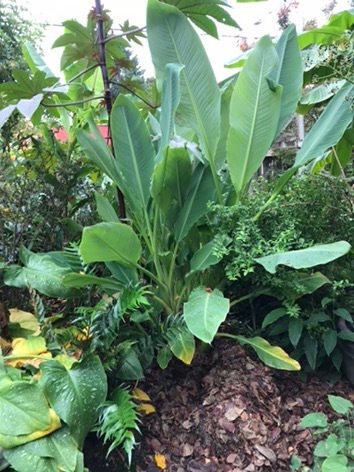 Musella lasiocarpa, topping out at about 6′ in my garden, a relatively small banana with attractive glaucous, blue-green leaves. I usually pack this in leaves in the Fall. It generally freezes down for me, but has come back for 15 years or so. I have grown other bananas here in Portland including Ensete ventricosum ‘Maureli’, the large and fast growing Red Abyssinian Banana, native to the highlands along the eastern edge of the African Plateau and Rift, Ethiopia, south through Uganda, Kenya, Tanzania, Malawi, Zimbabwe and Mozambique; the hardy and most ‘drought’ tolerant banana Musella lasiocarpa, one of the most northerly bananas coming from Hunan and Yunnan provinces of China, commonly known as the Chinese Yellow Flowering Banana; a tender and dwarf Cavendish cultivar for a little while; the selection M. acuminata ‘Siam Ruby’ which was gorgeous, but more temperamental for me than M.a. ssp. zebrina, the ‘parent’ of ‘Siam Ruby, native to very tropical, Java; and two allegedly, hardier and edible cultivars, M. ‘Rajapuri’ and M. ‘Orinoco’. Because there are so many variable involved in growing any plant we must be wary of claims of hardiness. 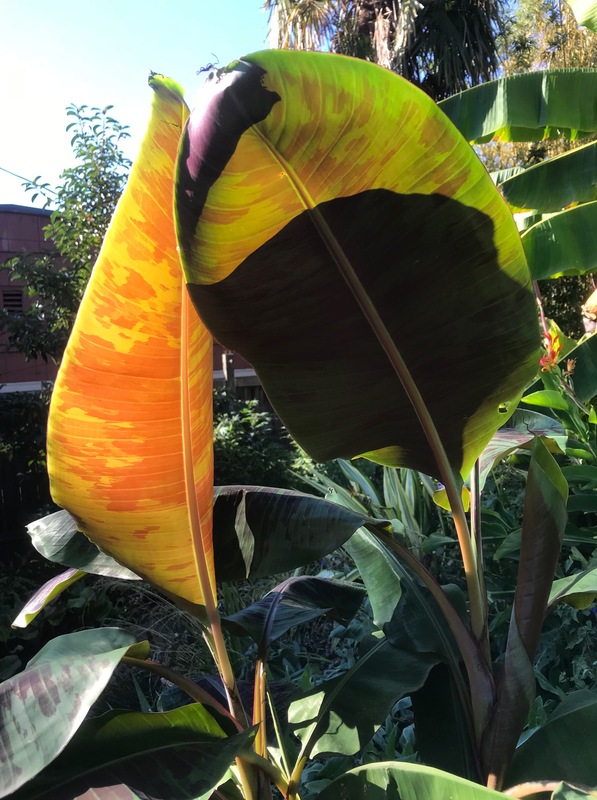 ‘How’ well a plant grows during the season, how long that season is, how much a region typically cools during summer nights, all can effect a plant’s ‘cold hardiness’..
Bananas. org makes the claim that Rajapuri can ‘survive’ down into USDA zn 8, 10ºF, as does Plant Delights and several other sites….If this is true in some regions their soil and climate must be different than ours. Perhaps its a winter rain thing or because their summers are hotter, I don’t know. Many banana growers are in the American deep south up through North Carolina and, while their winter minimum temperature maybe comparable to ours their summers are hotter, more humid without the night time cooling we typically get. Good for us, less so for tropicals and bananas I suspect. I grew these latter two bananas in my early Banana years and they got tossed after a winter when their pseudo-stems froze down….Later I realized that the rhizomes may have still been viable, they were I recall still ‘solid’ though the condition of their meristems were unknown…I didn’t check and I didn’t try them again. It turns out that Burl Mostul has grown both of those varieties and a dozen others…none of which have proven hardy for him consistently, outside in the ground…but I’m in Portland’s inner southeast ‘banana belt’! They may be candidates for those ambitious enough to grow them in large tubs and protect them from our winter extremes. I just don’t have the space. This is part of the fascination with growing plants at their margins, success and hardiness involves more than the simple extremes of temperature a plant might be subjected to! The very showy fruit of Musa velutina, a species, in a picture from Annie’s Annuals. 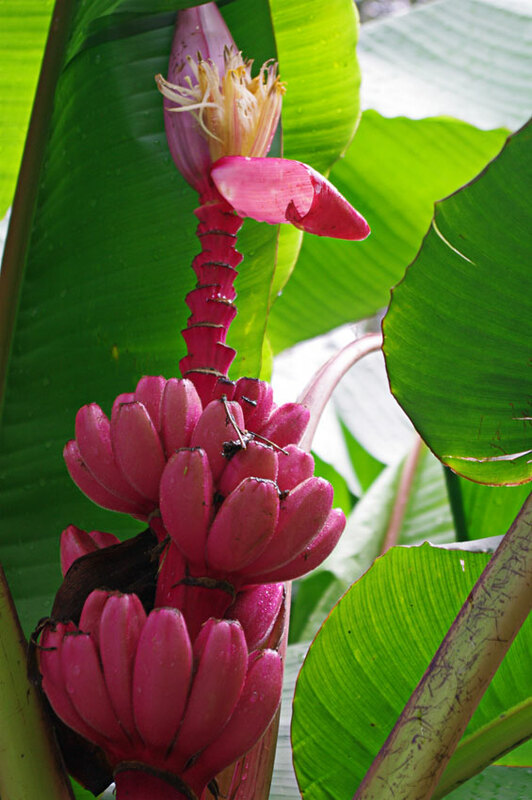 All bananas have separate male and female flowers on the same plant. The male flowers form at the extending tip of the fruiting stem, the female flowers later. In species this encourages cross pollination. Pollination is not necessary on the edible cultivars, in fact not all of them even produce pollen. I‘ve always intended to try M. velutina, but haven’t as of yet. It comes from Assam, another province of northern India, east of Sikkim, which includes the headwaters of the Brahmaputra River in the Himalayas, which suggests hardiness here. Annie’s Annuals and Plant Delights both say this is hardy to zn 7b, down to 5ºF!!! but I don’t know anyone here that’s grown it successfully outside. Allegedly, like M. sikkimensis, this is claimed to have adapted well beyond the cold limits of the tropics…just how far and whether it can endure here or not, I don’t know…yet! The lure of exotic plants, especially with graphic markings and edible fruit in the NW is strong! The plants we now recognize as bananas first appeared some 50 Mya, long before humans and the possibility of our memory. This is pre-history, a story cobbled together from various starting points, creating a changing network of story lines, that have shifted with science and our understanding. It is difficult enough for two people today to agree on the events of a shared yesterday, let alone of a time so far beyond our own experience. Like any other organism bananas exist in time…there was a before and there will be an after. We have a hard time with this concept as short lived temporal creatures ourselves. Over this period much has happened for bananas. They have proven highly adaptable…within wet tropical climates, with a record of success much longer than our own. A few species have been able to adapt to the cold they’ve been subjected to along their range’s northern limits as well as the cold they confronted at higher elevations, Musa basjoo, in Japan and the Ryukyu Islands, Musa sikkimensis and M. velutina, in the eastern Himalayas. Will they adapt further as the long cycle of glacial and inter-glacial periods of this Ice Age continue. Who knows? Will we? My money is on, maybe…slightly…not that I will ever know! The tropical conditions within SE Asia, the Philippines and the rest of the area once known as the East Indies, will, in all likelihood, continue for many more millions of years, however, as Man induced ‘climate change’ continues, there have been increasing periods of drought in Malaysia which will become problematic for bananas there. What this will mean for this region is unknown, but it is worrisome. Wild populations of Musa spp. will likely experience a loss of supportive landscapes as a result of this drying, added to the losses of habitat they’ve been experiencing as wild lands are converted to human use, as large plantation farms dedicated to the production of export crops continue to proliferate. Bananas have ‘always’ had this soft, warm, southern edge to move to in order to escape cold temperatures. Experts expect an uptick in extinctions now in this portion of Musa’s range. The marginal species in the north had previously seemed to be the most precarious. Life on Earth has always seemed to be a bit of a crap shoot, but overall diversity has increased over time despite the countless extinctions that have occurred…even taking into account the Earth’s several major extinction events. Species rebound! New are created! This world is nothing if not dynamic. Had Australia drifted a little more easterly, the Malayan Archipelago wouldn’t exist as it does today and Musa’s once safe haven from the cold would have been greatly limited. Had there been only deep seas with a few widely scattered islands, the surviving bananas would be very different. They could be only a minor note in the fossil record. On the other hand had the Australian Plate remained attached to Antarctica, blocking the circumpolar ocean current, perhaps we never would have entered the long cool period that we have and most of North America would still be enjoying the tropical and sub-tropical climate we once had…and we would have our own banana species….So many ifs! Knowing this, as an ‘intelligent’ people, shouldn’t we be doing all that we can to insure the continuation of the life and all of its systems and cycles that we can?